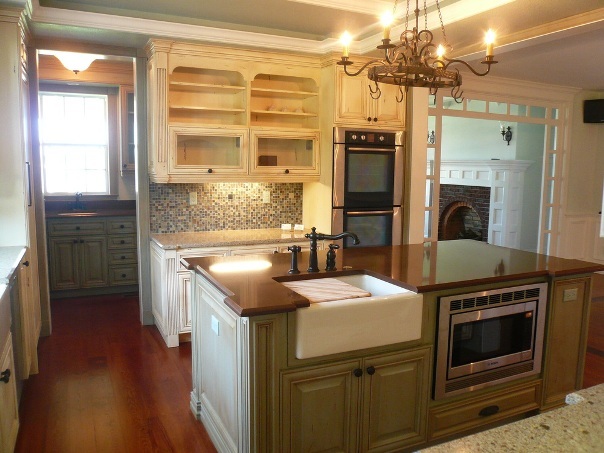 Searching for kitchen cabinets in Merritt Island, FL? We here at Cabinet Designs of Central Florida have designed and built kitchen cabinets in Merritt Island, FL for over 30 years. Don't settle for what the big orange box store can order you; let us design and build you the kitchen of your dreams...with no middleman markups. Call us at (321) 636-1101 or stop by our showroom to discuss your project. * Maximize every inch of space. No fillers. * Odd cabinet sizes - no problem. That's what we do. Merritt Island, FL is where it all started for Cabinet Designs of Central Florida. In the summer of 1984, Dan took a huge leap of faith. After 6 years of building yacht cabinets for Sea Ray, he and a partner set up shop with a table saw and a few hand tools in a rented Merritt Island bay on Myrtice Avenue. It turned out to be a pretty good move. And Dan's knack for kitchen design and building high quality custom cabinets quickly paid off. We love designing and building custom cabinets throughout Brevard County, but Merritt Island Florida is our first love. Dan and Sherry still call North Merritt Island home. Leslie and Scott met and had their first date at the Merritt Square Mall when they were 13 years old. And Leslie is a proud Merritt Island High School alumnus. Not only do we love the residents (our friends and family), but also, the diversity of kitchen remodel and new construction projects that Merritt Island area residents and ask us to bring to life. One project might take us to the orange groves of North Merritt Island or to the tree hammocks in South Merritt Island. And of course, all of the many riverfront homes along the Indian River we’ve completed through the years. We have completed hundreds of jobs in Merritt Island since 1984. Not only have we worked with homeowners on kitchen and bathroom remodel projects, but we’ve built bookcases, bars, outdoor kitchens, home offices, closets, and more. We consider cabinet making an art form - one that demands painstaking attention to detail. We like that our friends on Merritt Island always seem to feel the same way and appreciate quality and craftsmanship. Thanks for checking us out. Give us a call, stop by our showroom, or fill out the form on the right and we'll contact you. We'd love to discuss your current project with you and see if we'd make be a good fit. We believe that when it comes to cabinetry: design, quality, and functionality matters. You can check out our portfolio of kitchens here. And see how we build our cabinetry; of which every component is build right here locally in our Rockledge factory.